It seems that everywhere we turn lately, people are talking about soil. Whether it’s about the dire state of global soils, the astonishing microbial and fungal diversity in healthy soils, or the role soils play in mitigating climate change, it’s clear that more people are becoming interested in the hidden world under their feet. Soil is quite literally the basis of every project at RDG, whether we’re dealing with denuded farm soils, contaminated urban soils, eroding slopes, or fragile riparian buffers. So we’ve been heartened by the conversations around soil that seem to be happening with greater frequency, among a greater cross section of stakeholders. I just returned from Regeneration Canada’s Living Soils Symposium (Symposium Sols Vivants) in Montreal. Organized over three and a half days, the symposium brought together an inspiring array of speakers and attendees. Organic market farmers and conventional monocrop farmers. Agroforestry researchers and urban food forest organizers. Soil microbiologists and botanists. Holistic grazers and foresters. 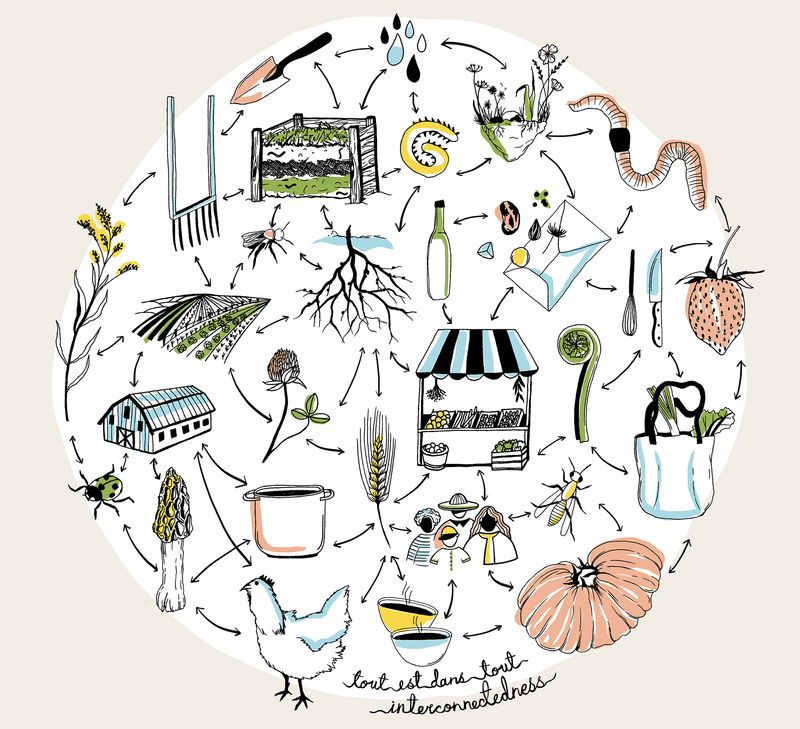 Artists, chefs, carbon markets experts, policy makers, and land use planners. It was a remarkable reminder that we all rely on healthy soils – and we all have a role in soil stewardship. 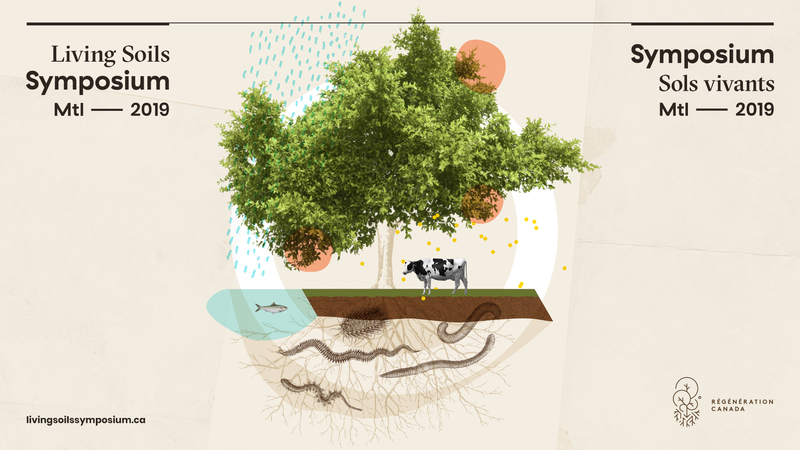 “Tous est dans Tout” – Artwork by Laucolo, for the Living Soils Symposium. Overall, there was consensus about the dire state of global soil health, and what will be the increasing challenges of climate change. There seemed, too, to be consensus about how industrial agriculture has been disastrous for water, soils, biodiversity, and local farming economies. And, because this symposium was largely focused on working lands, people agreed that applying regenerative principles to agriculture is essential if we are to sink and store carbon, rebuild living soils, grow nutrient-dense food, and increase overall resiliency across our landscapes. Talking with Joel Salatin of Polyface Farm during a “campfire conversation”. We here at RDG continue to learn about healthy soils initiatives, and the policies, funding mechanisms, and collaborations that inform successful implementation. During a policy panel that covered a range of programs, some attendees – citing the diminishing window of time in which we have to act on climate change – called for more swift and decisive government intervention in transitioning from industrial to regenerative agriculture. Others felt that no matter how dire the situation, policy must arise from a democratic — and research-backed — process, and reflect the diversity of challenges, needs, and opportunities on the ground. I was particularly interested in hearing from Jenny Lester Moffitt, undersecretary of the California Department of Food and Agriculture, whose presentation on the incentives programs and demonstration projects of California’s Healthy Soils Program reiterated the necessity of good science, adequate funding, robust technical assistance, and farmer-to-farmer knowledge transfer. 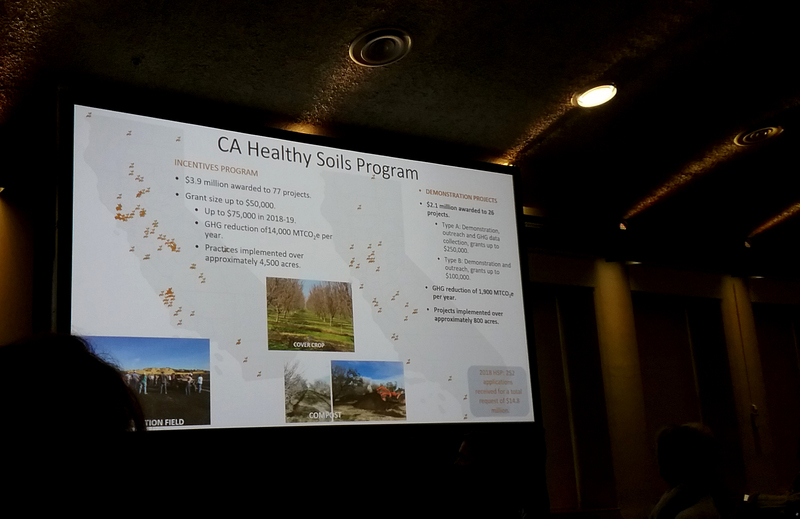 A map of the active incentives programs and demonstration sites throughout California, a build out of the state’s Healthy Soils Plan. Of course, the breadth and depth of conversations that transpired over the course of the Symposium are impossible to cover here. A key takeaway, perhaps not surprisingly, is that a collaborative, whole systems approach is essential to transforming the way we manage and value natural resources, and meet the challenge of climate change. 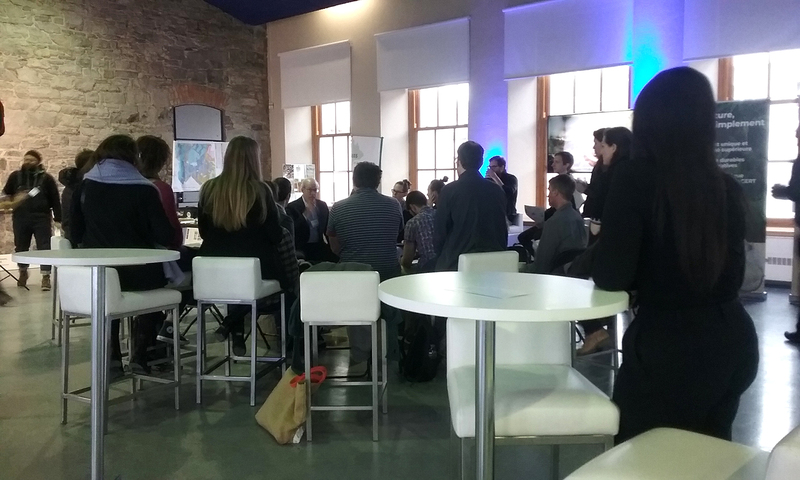 As ecological land use planners and designers, we are accustomed to this way of looking at challenges and opportunities, regularly calling on the expertise, skills, and perspectives of other disciplines and stakeholders. We will continue to share projects and resources here on our site, particularly those that are addressing carbon drawdown through regenerative agriculture and innovative land management. In the meantime, here are some links to people and organizations doing good soils work around the world. Nonprofit organization wanting to advance the practice, and spread awareness of the opportunity, of turning atmospheric carbon into living landscapes and soil carbon. An outcome-based, verifiable standard designed to improve soil health and build soil carbon by encouraging the shift to regenerative agricultural practices. In response to the rapid pace of global climate change, seeks to enhance carbon sequestration in rangeland, agricultural, and forest soils through applied research, demonstration and implementation in Marin County, CA. Promotes land management practices that regenerate soil health, in order to mitigate climate change, restore biodiversity, improve water cycles, and support a more productive and just food system. And they know how to put on a conference! Promote, facilitate, and accelerate the global transition to regenerative food, farming and land management for the purpose of restoring climate stability, ending world hunger and rebuilding deteriorated social, ecological and economic systems. Five key soil advocacy programs, designed to increase soil carbon & biodiversity on 500 million acres of land by 2050. On a mission to reverse climate change, by creating a new way for anyone in the world to pay to remove excess carbon dioxide from the atmosphere. Developing regional fiber systems that build soil & protect the health of our biosphere.